— Our end-of-the-week picks for April 27-29, including a G.E. Smith concert at Salamander Resort & Spa, Middleburg Humane Foundation’s Blue Jean Ball, the Middleburg Hunt Point-to-Point and the town’s annual Arbor Day celebration. 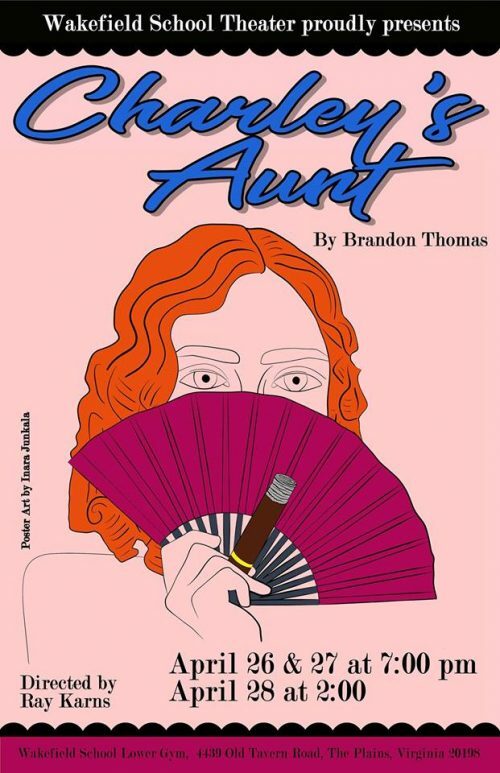 Wakefield School Performing Arts presents their spring production, “Charley’s Aunt!” Wakefield’s talented Upper School cast presents a comedy like no other. Jack Chesney loves Kitty Verdun and Charley loves Miss Amy Spettigue. They invite the ladies to meet Charley’s wealthy aunt from Brazil. Canceling her visit at the last minute, the millionaire aunt sends the boys into cataclysmic confusion. What do they do now? G.E. Smith Concert at Salamander Resort & Spa: April 27 | 6-9 p.m.
G. E. Smith is coming to Middleburg! Join us on Friday in Salamander’s living room for a complimentary concert from the former Saturday Night Live Band front-man. 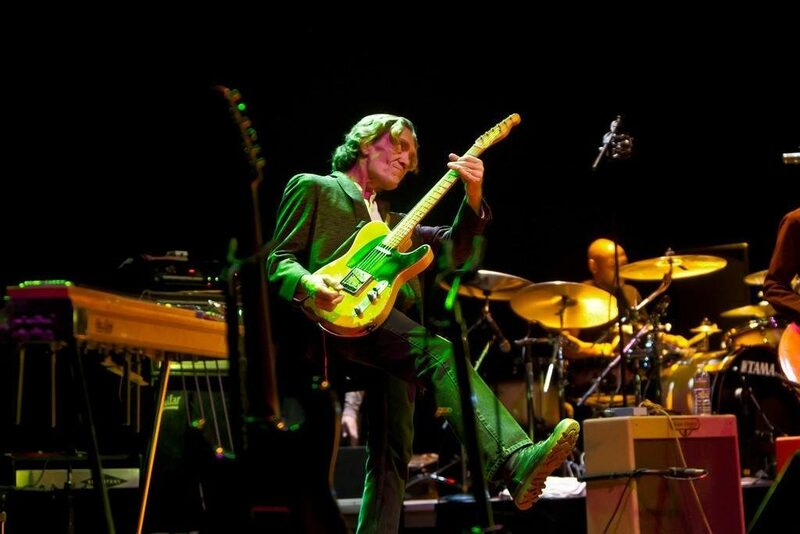 A soulful guitarist, composer, singer and bandleader, G. E. Smith also was the lead guitarist in the band Hall & Oates and was Bob Dylan’s guitarist in the late 1980s and early 1990s. Enjoy the intimate, acoustic concert while relishing in Salamander’s special menu of small bites and refreshing cocktails. For more information, please call 540-326-4070. 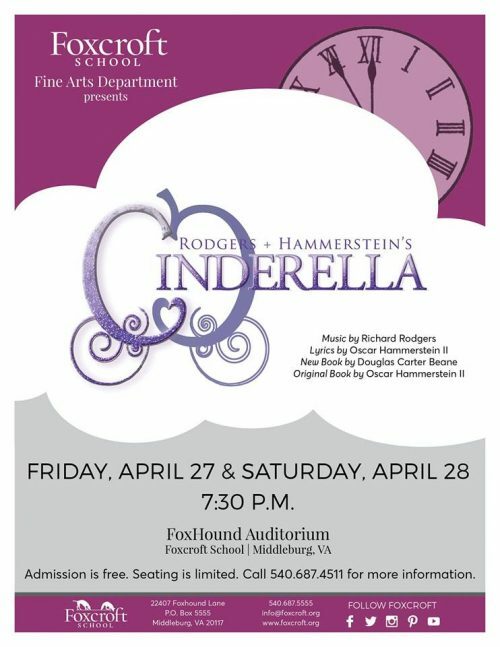 Rodgers & Hammerstein’s “Cinderella” at Foxcroft School: April 27 & 28 | 7:30 p.m.
Join us for the spring performing arts production of Rodgers & Hammerstein’s “Cinderella,” presented by the Foxcroft Fine Arts Department and the Main Stage class. Admission is free, but space is limited. Call 540-687-4511 for more information or to reserve your spot. Arbor Day Celebration at Middleburg Community Charter School: April 28 | 9-10:30 a.m. This year’s Arbor Day event will feature a number of family-friendly activities, including musical performances and art displays. Mayor Davis will be on-hand for the festivities. Students from the Middleburg Charter School and The Hill School will receive recognition for winning the multi-media contest this year! 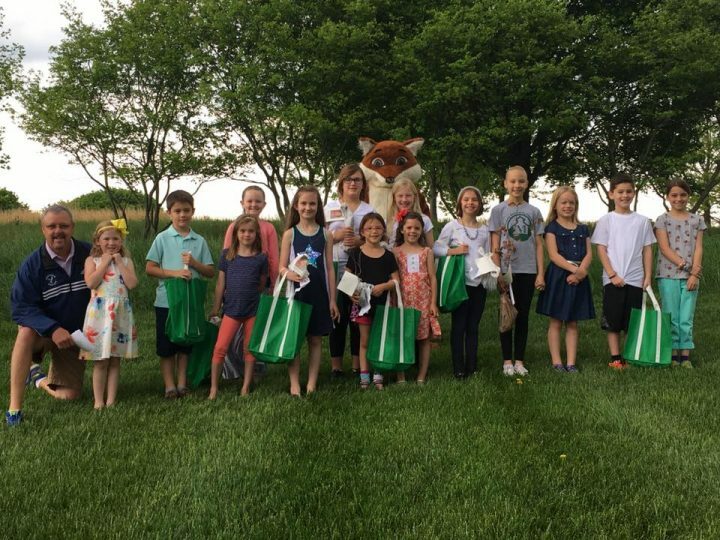 Middleburg’s Arbor Day Celebration is sponsored by the Town of Middleburg, the Town of Middleburg’s Streetscape Committee, the Middleburg Beautification and Preservation Association, and the Loudoun County Department of Forestry. For additional information, visit middleburgva.gov. 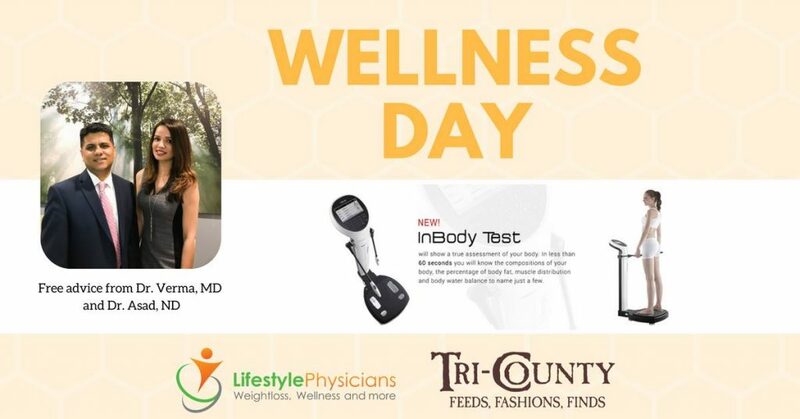 Wellness Day at Tri-County Feeds, Fashions, Finds: April 28 | 10 a.m.-1 p.m.
Get a “leg up” on your health and join Lifestyle Physicians for a free Wellness Day at Tri-County Feeds, Fashions, Finds, including a free InBody test (valued at $50) that will tell you how much fat, muscle mass and water is in your body, free B12 injections ($30 value), a blood pressure check, weight loss information, naturopathic care by Dr. Sheeba Asad, information on lowering your cholesterol naturally, free advice from doctors and more. “The Front Royal Remount Depot: Human, Equine, and Canine Stories” at the National Sporting Library & Museum: April 28 | 5-6:30 p.m. Offered in partnership with Front Royal 4H, this program explores the beginning, middle, and end of the Remount’s human, equine, and canine stories. Purchased in 1911, the Remount was a staging station for the Army’s war horse and canine training and breeding program until 1948. Thousands of horses came east by train to Front Royal where they were made fit to serve, then shipped to Norfolk where they boarded transport ships to Europe. There is a long and fascinating history here of the great and good horses, mules, and dogs who were stationed in Front Royal to serve our country before and after both World Wars. 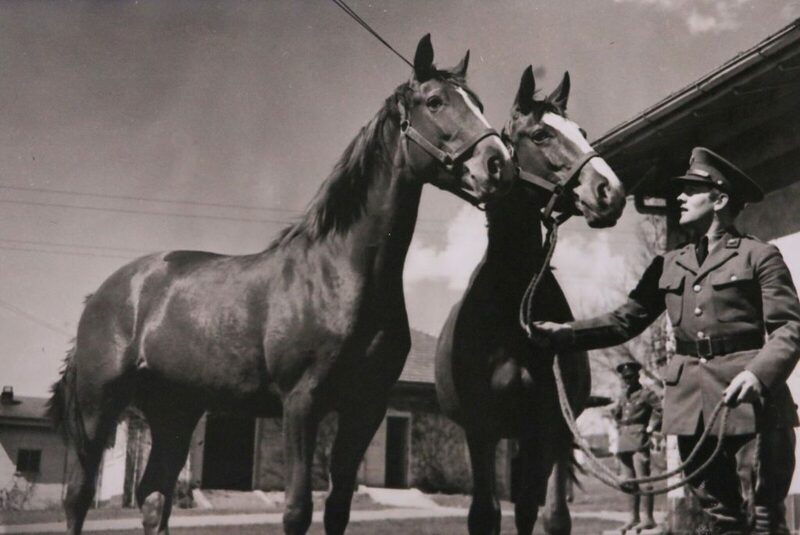 Some famous residents of the Remount station include Man O’ War and the German Lipizzaners captured in WWII. $5 admission, NSLM and 4H members free. Please register to Anne Marie Paquette: apaquette@nationalsporting.org or 540-687-6542, ext. 25. 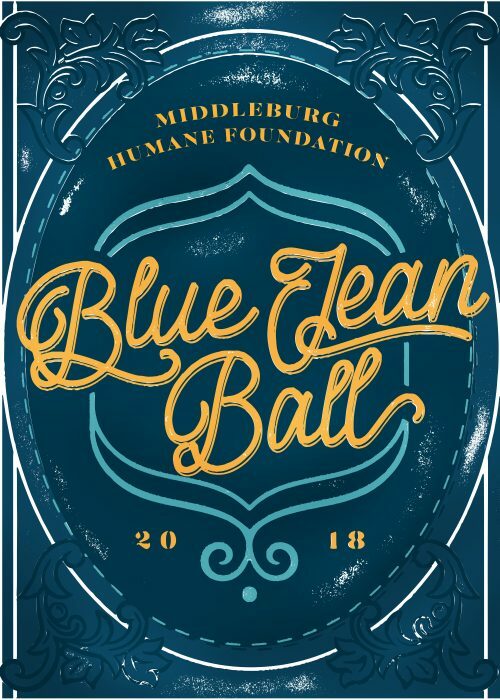 The Middleburg Humane Foundation Board of Directors requests the pleasure of your company at the MHF Blue Jean Ball, featuring a live auction, cocktail hour with oysters & hors-d’oeuvres, dinner, dessert, open bar, and dancing. Leave the gowns & tux at home! Photo courtesy of Liz Callar. 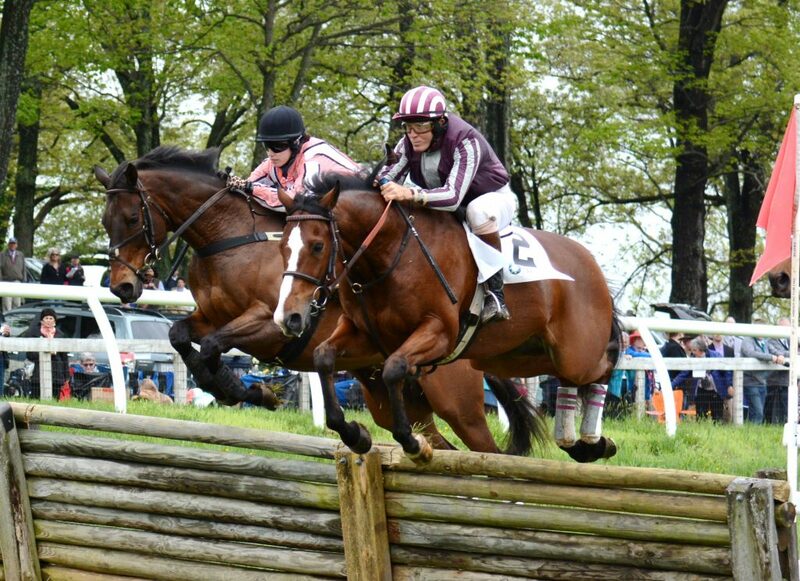 Middleburg Hunt Point-to-Point: April 29 | 1 p.m.
Join us for a day in the country to enjoy the exciting sport of steeplechase racing at one of the most beautiful race courses in the nation. Glenwood Park is known for offering spectators a spectacular view of the racing action. This year’s race card once again includes racing over the timber course, the hurdle course and on the flat. 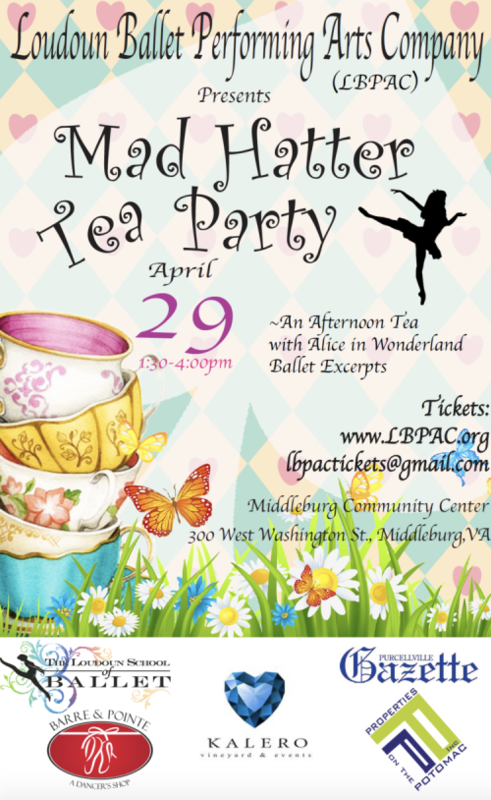 Wonderland Ballet at the Mad Hatter’s Tea Party at the Middleburg Community Center: April 29 | 1-2 p.m. The Loudoun Ballet Performing Arts Co. presents “Wonderland Ballet at the Mad Hatter’s Tea Party!” Learn about ballet, watch excerpts of “Alice in Wonderland” and mingle with the staff and artists at a wine reception afterwards at the Middleburg Community Center. $45 for adults, $25 for children ages 12 and under. Click here to buy tickets. Cocktails with Cupcake at Salamander Resort & Spa: April 27 & 28 | 4-5 p.m.
Aqua Yoga Workshop at Salamander Resort & Spa: April 28 | 11 a.m.
RxR3 Recovery Lounge Presentation at Tri-County Feeds, Fashions, Finds: April 28 | 1-2 p.m.
Live Music at Three Fox Vineyards: April 28 | 1:30-4:30 p.m.
Sushi Rolling Class at Salamander Resort & Spa: April 28 | 2 p.m.
Hunter Show at Fox Chase Farm: April 29 | 9 a.m.
Musical Freestyle Lecture with Debbie Marriott at Tri-County Feeds, Fashions, Finds: April 29 | 1-3 p.m.
Cinco de Mayo Celebration at the Middleburg Community Center: May 3 | 6-8 p.m. 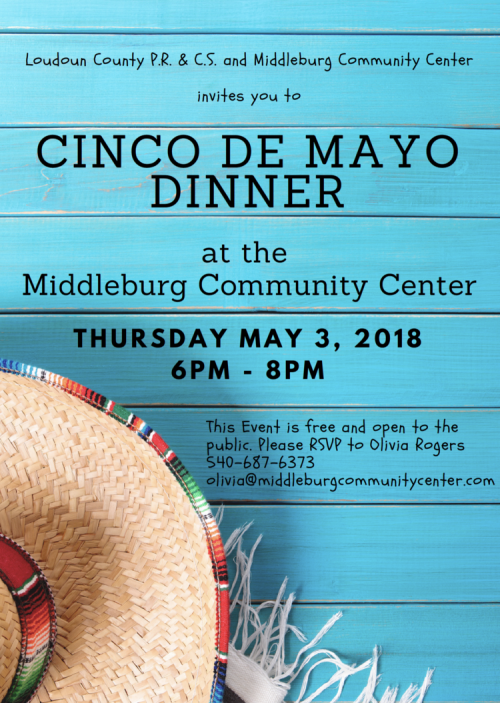 Celebrate Cinco de Mayo with all your Middleburg friends! Kids can take part in hitting the piñata. Please call 540-687-6373 by April 29 to RSVP. This event is free and open to the public! 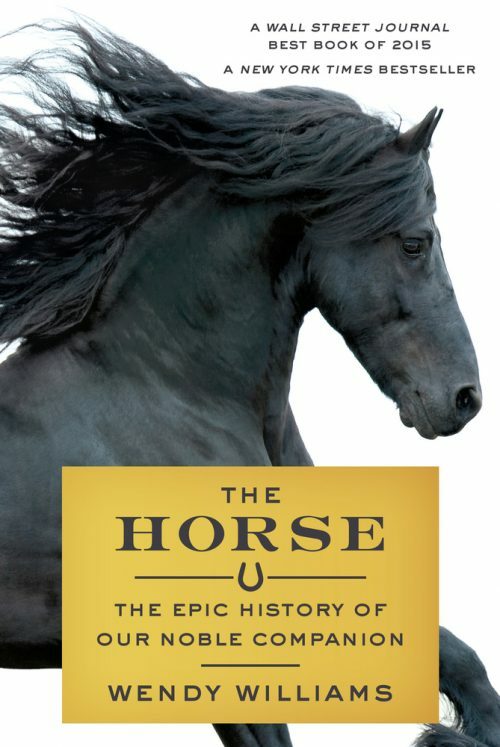 The Horse: Meet the Author with Wendy Williams at the National Sporting Library & Museum: May 4 | 6-8 p.m.
“The Horse: The Epic Story of our Noble Companions” is a revealing account of the animal who has been at our side through the ages, befriending us and traveling with us over the mountains and across the plains. Author Wendy Williams blended her own experience with horses with biological and sociological research to create this masterful work of narrative nonfiction. Presented in partnership with the Oak Spring Foundation, the May 4 event will include a reception, book signing, and talk highlighting scientific and compassionate insights into human-equine relationships across the globe. Champagne reception starts at 6 p.m., talk and book signing begins at 7 p.m. $10 admission, free to NSLM members. Please register to Anne Marie Paquette at apaquette@nationalsporting.org or 540-687-6542, ext. 25. Frogmen and Brewskies at Side Saddle Cafe: May 4 | 6-10 p.m.
Join us for Side Saddle’s annual Navy Seal Foundation Fundraiser in honor of their own real life superhero, Chief Petty Officer Charles H. Keating IV (1985-2016). Tap Takeover by Honor Brewing Co., live music, and grand company, so come on out and help them raise some funds for the women and men who help keep us free! The Virginia Gold Cup steeplechase races are a celebration of hunt country tradition and one of the largest outdoor social events held in Virginia. 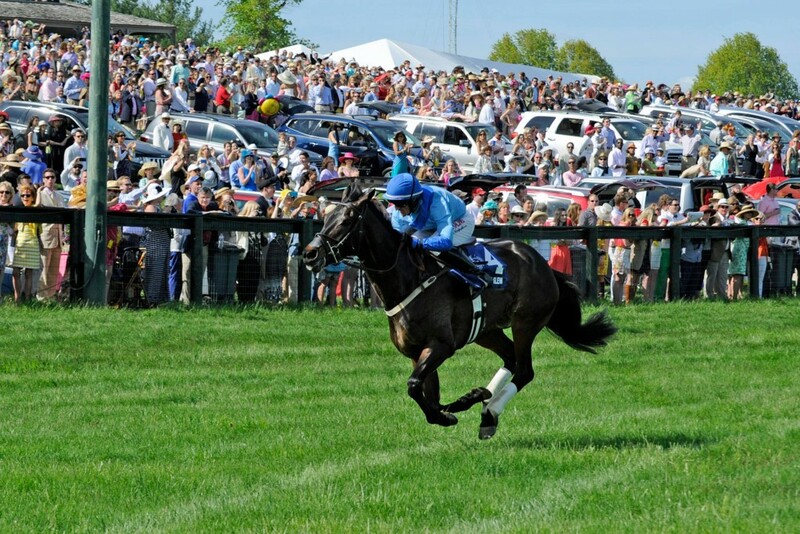 The Virginia Gold Cup is held the first Saturday of May at Great Meadow in The Plains, Virginia. Additional activities include terrier and pony races before the main event, hat contests on Members Hill, vendor tents and booths, parachute demonstrations, classic and new car displays, and countless tailgates. Viewing areas are divided into three basic sections: North Rail, South Rail, and Members Hill. Members Hill overlooks Winners Circle and has the best view of the course. All three sections include private tents, public viewing areas, and tailgate spaces. North Rail is geared more toward young professionals and social groups; South Rail is where most corporate tents and family-oriented outings congregate. For tickets and additional information, please visit vagoldcup.com. Join us as Three Fox celebrates 17 years of growing great estate vintages! Special discounts available. Lieutenant Colonel Eric W. Buckland, a retired Army Special Forces Officer and award-winning author of six books about some of the men who rode with the famous and legendary Mosby’s Rangers during the Civil War, will join us from 11 a.m.-5 p.m. to sell and sign his books. Stop by to peruse his books and chat with him about the historic exploits of Mosby’s Rangers. Enjoy live music by the Tower Blues Band from 1:30-4:30 p.m.! Be SMART for Kids at Middleburg Library: May 5 | 3-4 p.m. Learn important parenting and everyday life steps to keeping your kids safer. 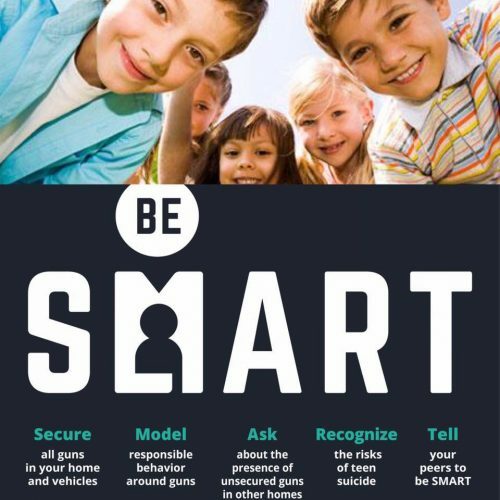 The Be SMART campaign is focused on reducing suicides and unintentional shootings that occur when children get a hold of unsecured firearms. Learn more at besmartforkids.org. 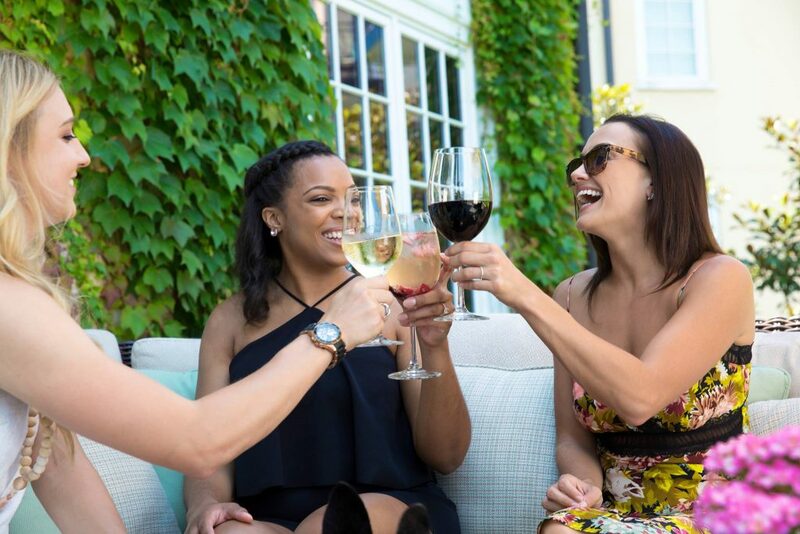 Sounds of Salamander at Salamander Resort & Spa: May 6 | 4-7 p.m.
Sunday Funday has been redefined with Salamander’s weekly event! 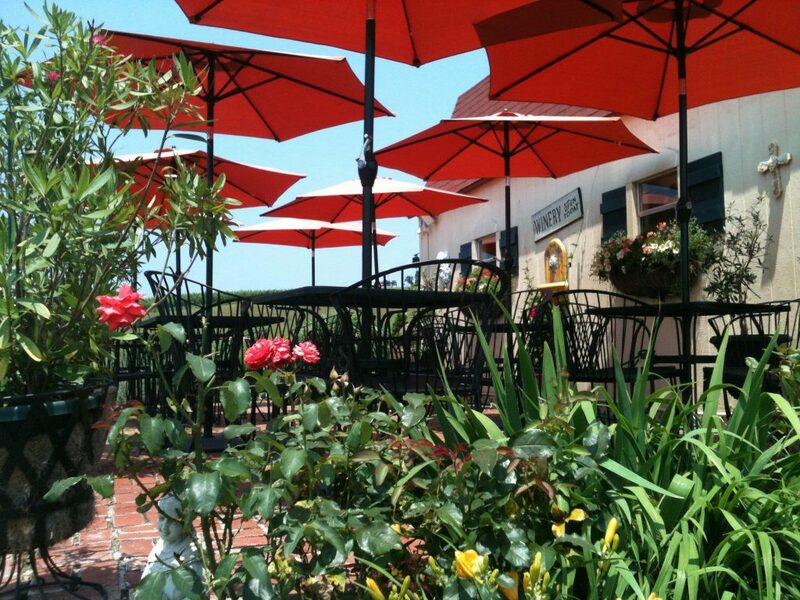 While enjoying sensational views of the Virginia countryside, feast on their fresh al fresco menu, spoil yourself with their seasonal beverages and take in the sounds of an acoustic guitar all while enjoying the summer sun on their terrace. Performances include hometown artists to professional recording artists from Nashville, Tennessee. Sundays through Sept. 30. For more information, please call 540-326-4070 or click here to see a schedule of the performances. Family Storytime at Middleburg Library: April 30 | 11-11:30 a.m.
Maker Monday at Middleburg Library: April 30 | 4-5 p.m.
Wine & Painting Class at Salamander Resort & Spa: May 1 | 7-9 p.m.
Gallery Talk at the National Sporting Library & Museum: May 2 | 2-2:30 p.m.
Cocktails ‘n Charcuterie at Side Saddle Cafe: May 3 | 4:30-8 p.m.
Sunday Sketch with Ruthie Windsor-Mann at the National Sporting Library & Museum: May 6 | 2-4 p.m. Remember to check our calendar for even more upcoming events!